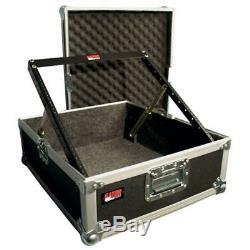 Gator road case with built-in 12U pop-up rack. Front & rear rack rails. 3.2mm thick rack rails. 17 Inch rackable depth with lid removed. 9mm plywood construction with PVC exterior. Size: 26.5" x 9.9" x 22. Interior dimensions: 21 x 19.25 x 6.5. The item "Gator Case G-TOUR 12PU Pop-Up ATA Road Case, 12U Spaces NEW" is in sale since Monday, September 10, 2018. This item is in the category "Musical Instruments & Gear\Pro Audio Equipment\Cases, Racks & Bags". The seller is "quaturbo" and is located in Ormond Beach, Florida. This item can be shipped to United States.